← Need Dimensions for Factory Cartridges? Benjamin, Rogue 357 Air Rifle. 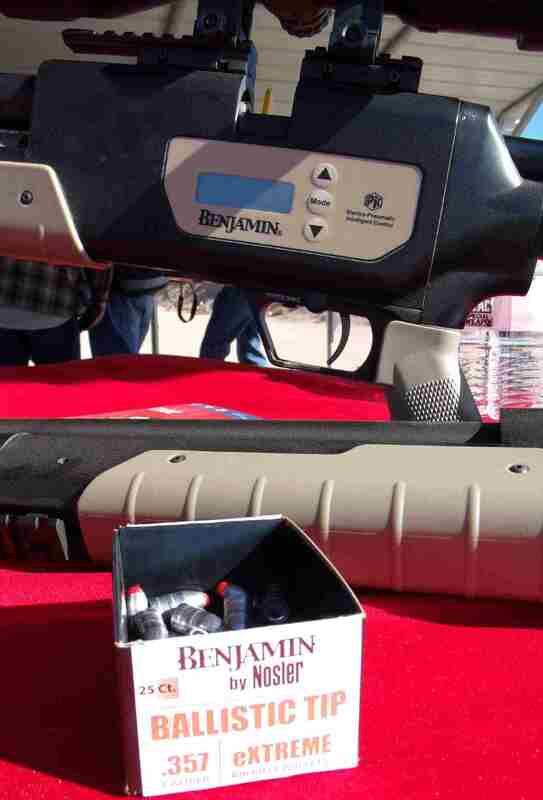 While big bore airguns have been around since before Lewis and Clark, ePCP™ technology is NEW and exclusive to Benjamin! The various ePCP components include at the time of this writing, bullets are offered in 5 weights from 95 to 170 grains. Muzzle velocity is similar to low power pistols ranging from 700 to 1000 fps. The patent-pending eVALVE technology on the Rogue provides regulation of pressure in the air reservoir which guarantees more shots per fill, through the efficient control of pressure. There are two power settings, High Power for large game like hogs and coyotes or Medium Power for raccoons, bobcats and fox, then select your bullet grain weight, Heavy or Light. The Rogue will then release the amount of air you need to make the shot. The Rogue features a 6-shot magazine that accommodates all shapes of .357 caliber bullets perfectly, whether they are the Benjamin eXTREME Pursuit flat nose or hollow points, Nosler Ballistic Tip bullets or your own cast bullets. It’s important to note that this rifle uses dry bullets, no lube. In many ways the Rogue is like hunting with a rimfire. Recoil is low, even though knock down in much greater do to the larger diameter and heavier bullets used. You might be surprised by the accuracy of this air rifle. If you hunt close to town or anyplace where the noise of a standard rifle might be an issue this rifle might be a good substitute. A couple of things that some shooters will want to know: first it requires a pressure tank to fill the reservoir in the gun, Benjamin sells one or you can use a scuba tank. Second, and this is a huge positive, the Rogue has a six shot magazine, so you can shoot about as fast as with any bolt action gun. That rifle has been off the market since 2013. I have not seen any for sale.